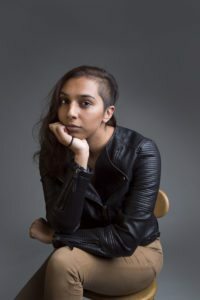 Umber is a Muslim, queer, Pakistani-British feminist. Family was an important part of their childhood and although they experienced sexism from their father’s side of their family, their mother and grandmother were strong female role models. Growing up, Umber felt that they did not identify as a girl, or any other gender. They are passionate about activism and community on a personal scale. ‘Unlike a lot of young people raised Muslim, I always thought of my religion as putting women first. I think it’s about what you choose to teach what readings you choose to teach, which parts of the Qu’ran you look at harder, and I think on the whole, objectively, I really do think the Qu’ran is very feminist. I think love between marginalised people is very radical. of that love rather than being so individualistic about it. I think community doesn’t exist right now.